Chinese medicinal processing includes various techniques used on traditional Chinese medicinals that serve to address the needs of clinical application, compounding, and the creation of prepared Chinese medicinal products. 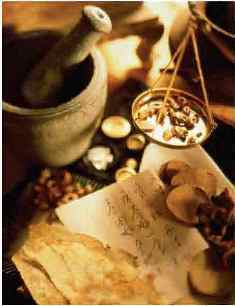 Pao Zhi (炮炙), Xiu Shi (修事) and Xiu Zhi (修治) are some of the terms used to describe medicinal processing throughout Chinese history. The earliest implication of the term Pao Zhi was the treatment of medicinals with fire, something akin to baking or roasting. Pao (炮) means to “wrap substances and heat“, which is akin to dry frying or scalding. Zhi (炙) indicates heating with fire or frying with liquids. The earliest processing techniques were written as footnotes to the medicinals in a given formula, for example: “Rhubarb (Da Huang) - 4 liang, washed in alcohol“, “Cornus (Shan Zhu Yu)–4 liang, moistened with alcohol “, “Hoelen (Fu Ling)–3 liang, stirred with milk“, or “Cooked Rehmannia (Shu Di Huang)–8 liang, stirred with Amomi seed alcohol, then steamed nine times and sundried nine times.“ Over time greater importance was gradually given to the art of medicinal processing and monographs on herbal processing were written. Nowadays, the production of Chinese medicinal substances has already moved away from traditional “mom and pop“ operations towards centralized, large scale mechanized facilities. This means that there is a greater research going into the mechanization and technological innovations involved in medicinal processing. This has resulted in greater standardization and modernization of the entire process and a more scientific approach to Chinese medicinal processing in general. Because the use of herbal medicine in modern times has tended towards standardization, the traditional idea of “one medicinal one method “ for herbal processing no longer exists. There are numerous traditional processing methods that are very unique and result in a medicinal that is particularly effective, nevertheless many of these techniques have been lost. Currently there are few of the old time processors left yet many of them are reluctant to share the knowledge they have gained over a lifetime of work in the field. The traditional processing techniques are all but gone and deserve special attention, lest they be lost forever. In the third printing of the 1977 edition of the Pharmacopoeia of People’s Republic of China (PPRC), under the section on General guidelines for medicinal processing, processing is divided into three categories: jingzhi - “clean“ processing, qiezhi–cutting processing, and paozhi–processing with fire; following editions of the Pharmacopoeia have continued to use these categorizations. Modern processing methods have gone far beyond the scope of using fire to process medicinals. Consequently, the ancient character of paozhi (炮炙), processing with fire, is now generally replaced with paozhi (炮制), which includes processing with fire but also refers to all methods of processing. Pao (炮) refers to the various processing methods that use fire in some capacity. Zhi (製) is a general term that means “to make“ and includes the numerous processing methods common today. Its meaning is more indicative of current practices. Most of those in the medicinal herb industry refer to the craft of paozhi as “yinpian processing“ or “yinpian paozhi“ (yinpian means sliced medicinals). “yinpian processing“ usually refers to medicinals that have been cleaned and sliced, whereas “yinpian paozhi“ refers to sliced or unsliced medicinals that have been treated with fire, water or a combination of the two so as to steam, stir-bake with some sort of fluid, calcine, cook, or soak. The 2010 edition (ninth printing) of the PPRC has a new orientation and standard for medicinal processing. In addition to increasing the number of criterion for standardization, it also listed the medicinals that undergo various processing methods separately, thus treating them as separate entries while also clarifying the channels to which each distinct specimen homes to as well as their functions and primary symptoms treated. Some examples are, Pinellia Rhizome processed with Alum (Qing Ban Xia), Pinellia Rhizome processed with Ginger (Jiang Ban Xia), and Processed Multiflorum (Zhi Shou Wu). In addition, the pharmacopeia has new definitions and corrections of general processing methods that better reflect current craft operations and the functions of processing equipment.